The first look of Anjaan is set to be released on April 14. 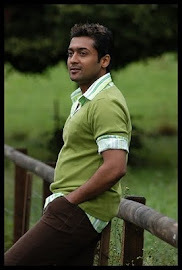 The film starring Surya and Samantha in the lead is being directed by Lingusamy. The rest of the star cast includes Prakash Raj, Manoj Bajpai, Dalip Tahil, Vidyut Jamwal and Rajpal Yadav. Music for the film is by Yuvan Shankar Raja. Dhananjayan of UTV tweeted, "Lingusamy sir assures to give the first look Advertisement ofAnjaan on 14th April. I am trying to ensure this happens to delight all fans"
Produced by Thirrupathi Brothers and UTV, the film is progressing at a brisk pace at Mumbai with music by Yuvan Shankar Raja. Surya plays dual roles in this action thriller film set against the backdrop of Mumbai. Interestingly, Chitrangda Singh has been roped in for a 'special song' in the Surya-Samantha starrer.